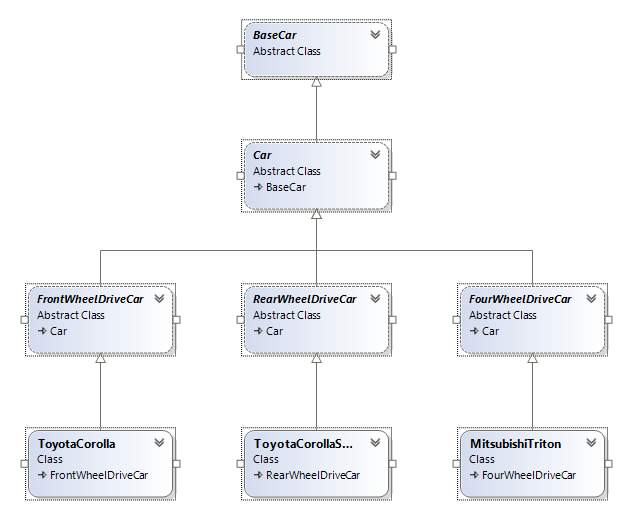 I have been discussing “Composition over Inheritance” with my teammates a lot on the last few weeks, and I really love to learn this kinds of patterns, but this one is kind of tricky, in the sense that it is not REALLY clear what is the benefit and, if misused, can bring more troubles than benefits. So I found this post, from the Coding Delight Blog, which, at least for me, help to understand the idea behind the pattern. I can only assume that the reason why inheritance is so overused in real world code is due to the way that it is taught. Back, far too many years ago, while I was still studying at university, the concepts of inheritance and polymorphism where both taught side by side, very early in the object-oriented programming course. It seems as though these lessons were particularly memorable, because so much real-world code has giant inheritance chains. We have ObscuredItems inheriting from DataItems inheriting from BasicItems which inherit from Items which inherit from BaseObjects. Often times you will have to go five or six classes deep to find the root cause of a bug. Our customers are very happy with what we have done so far and decide to commission us to create a four-wheel drive Mitsubishi Titan. Finally, the customer comes along and asks us to model for them a new experimental four-wheel drive buggy that is designed to go on sand and turns with all four wheels. A two-wheel drive buggy is also available (it also turns with all four wheels). Now we have a problem. We will obviously be deriving from our four-wheel drive class for the four-wheel drive model and the two-wheel drive class for the two-wheel drive model, but we will also have to override our TurnLeft and TurnRight methods in both classes, and the code will be duplicated.